This configurable wheelchair is designed to take heavy weights up to 20 stone for daily use. The HD version takes up to 25 stone. Price excluding VAT.(Incl. VAT £690) *VAT Relief available on this product. The Martin (HD) heavy-duty transit wheelchair has been built by Karma Mobility with your comfort in mind. 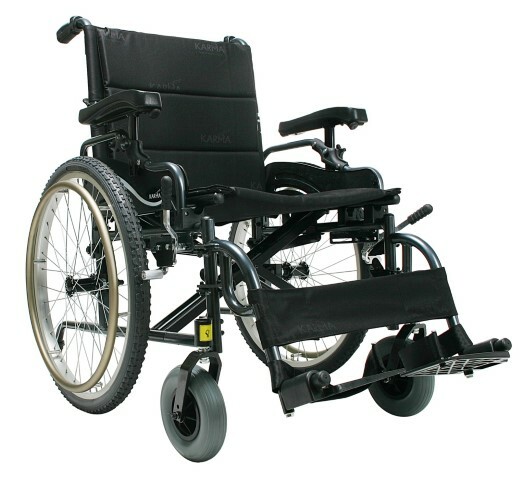 This wheelchair is durable, strong, reliable, and has a weight capacity of up to 25 stone. To make things easy for you, Karma has made sure that this wheelchair is highly adjustable, so you can customise it to your personal requirements. Additionally, the tension backrest will make sure that you are comfortable. Another feature is the progressive slowing brakes. These allow the attendant to have maximum control when pushing the chair on a hill or slope. The aluminium double cross-braced frame adds strength and stability while keeping the chair lightweight and manoeuvrable. The Martin HD has been crash tested which makes it safe to be used in vehicles where the user remains in the wheelchair. 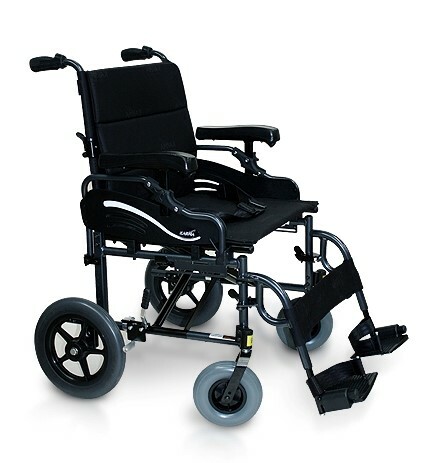 Other features include adjustable seat depth, adjustable armrests and footrests, seat belt, and puncture proof tyres.